This stop was all about taking a whirlwind adventure over a three-day period. We started with Pinnacles National Park, #7 so far on our trip, home of stunning rock formations, and the newest national park, having only become one in 2013… though it had been a national monument since way back in 1908. The park encompasses more than 26,000 acres, much of which is designated wilderness. 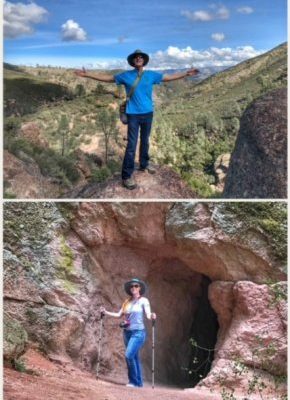 Hikers will love the more than 30 miles of trails found in Pinnacles, including the Balconies Cliffs Trail, Juniper Canyon Trail, and High Peaks Trail, but we were quite satisfied with hiking a combination of the Moses Spring Trail to the Bear Gulch Cave Trail (so amazing), crawling though caves and up carved steps until finally reaching Bear Gulch Reservoir… before descending back down along the Rim Trail. 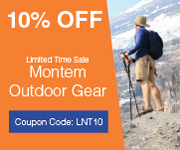 Into rock climbing? 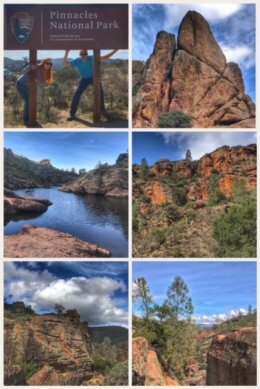 While the rock at Pinnacles is mostly breccia and tuff (which is softer/weaker than granite and basalt), we saw numerous folks out climbing some of the cool faces in the climbing areas within the park. The park is open year-round (and includes a visitor center, campground, camp store, and nature center), but the best time to visit is between mid-February and early June. 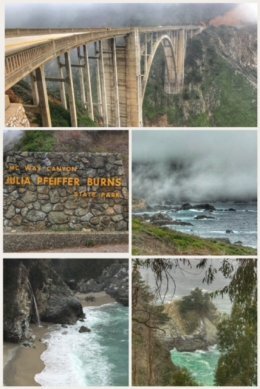 After Pinnacles, we headed west for the coast, riding down CA 1 — the Pacific Coast Highway — through Monterey, Carmel, Big Sur, all the way to Julia Pfeiffer Burns State Park. The coast was partially fogged in, but we still had a blast checking out the ocean, the rocky coast, and the famous Bixby Bridge (completed in 1932), along the Big Sur coastline, one of the most photographed bridges in California — and seen in the photo to the right. Also along the Big Sur coastline, we enjoyed visiting the McWay Falls, an 80-foot waterfall that falls onto the sand, within Julia Pfeiffer Burns State Park. 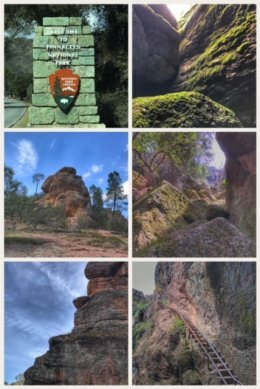 Both the falls and park are named after early pioneers… the falls for Christopher McWay, an early settler and farmer from New York state; and the park for Julia Pfeiffer Burns, a local and legendary early pioneer. The land itself was once part of an estate called “Waterfall House,” built by Lathrop and Helen Brown. 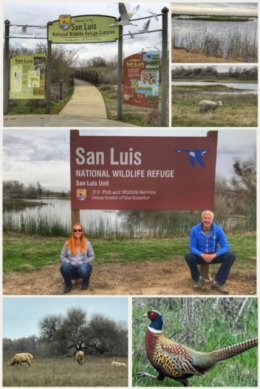 On our last day, we took in another wildlife refuge — the San Luis National Wildlife Refuge — and made many discoveries, including that salmon used to run in the San Joaquin River and that tule elk herds roamed throughout the Central Valley. The tule elk is one of only four subspecies of the North American Elk still slover today; the most widespread (and well-known) is the Rocky Mountain Elk. Happily, the tule elk population, once almost extinct, has now recovered to more than 4,000 throughout California. You’ll want to put this refuge on your list — especially if you enjoy driving more than hiking. The refuge has two wonderful auto tours (with stops at trailheads for additional hiking options). We did it all. The Tule Elk Auto Route is a 5-mile loop around the 780-acre enclosure that protects a herd of about 50 of these beautiful animals; we were lucky to see about three clusters of these beauties as we circled. We also drove the Waterfowl Auto Tour Route, an 8.5-mile journey through the restored wetlands of what had been partially ruined and drained by farming. We saw all kind of waterfowl, as well as pheasant and deer. The refuge is one of the one of the great remnants of a historically bountiful wintering grounds for migratory waterfowl on the Pacific Flyway. We ended this stop on a high note by visiting with great friend Nikki West, who was in Turlock for her mineral and rock business, Yosemite Mineral Company, at the Turlock Gem Show. 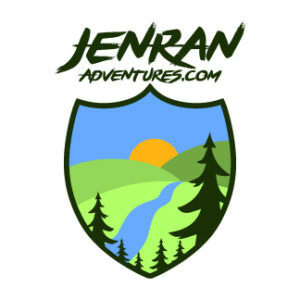 Finally, remember you’ll find more pictures and stories on all three of our Instagram accounts: @empoweringpines, @jenbenphoto, @jenranadventures. Next up… Lodi, CA, home of old vine Zinfandels. Hopefully you’ll hear from us again unless the Zins win!